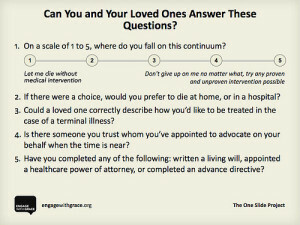 As patients, as family members, as friends, as health care providers, we have all faced end-of-life issues at one time or another, and we will face them again. And again. This weekend, for the fourth year in a row, the "Engage With Grace" message is being broadcast virally, through a "blog rally," at a time when many people are with family and friends over the long weekend. The point is: we all need to have the potentially uncomfortable conversation with people close to us about what kind of treatment we would want, and they would want, if incapable of making or communicating health care decisions. End-of-life decision-making has long been an issue of great personal and professional interest to me, and I am proud to have played a role in having out-of-hospital DNR orders recognized in Massachusetts by EMS providers, as an example. Download your copies of the Massachusetts health care proxy form or other states' proxy or living will forms – and add specific instructions about nutrition, hydration, and anything else that is important to you so that everything is crystal clear. My mom kept a stack of living will forms in the dining room when I was growing up, and was not shy about raising the issue with dinner guests and offering to witness their advance directives. Having the conversation is a starting point; we all need to follow through and make sure that our loved ones' wishes are documented, placed in medical records, discussed with physicians and other caregivers, and honored. Seems almost more fitting than usual this year, the year of making change happen. 2011 gave us the Arab Spring, people on the ground using social media to organize a real political revolution. And now, love it or hate it – it's the Occupy Wall Street movement that's got people talking. Smart people (like our good friend Susannah Fox) have made the point that unlike those political and economic movements, our mission isn't an issue we need to raise our fists about – it's an issue we have the luxury of being able to hold hands about. This is a time to be inspired, informed – to tackle our challenges in real, substantive, and scalable ways. Participating in this blog rally is just one small, yet huge, way that we can each keep that fire burning in our bellies, long after the turkey dinner is gone. « Privacy and Security: Joke or No Joke?